[PDF] Handbook of Thermal Process Modeling Steels | Free eBooks Download - EBOOKEE! Description: An Emerging Tool for Pioneering Engineers Co-published by the International Federation of Heat Treatment and Surface Engineering. Thermal processing is a highly precise science that does not easily lend itself to improvements through modeling, as the computations required to attain an accurate prediction of the microstructure and properties of work pieces is sophisticated beyond the capacity of human calculation.. Over the years, any developments in thermal processes relied largely on empiricism and traditional practice, but advancements in computer technology are beginning to change this. 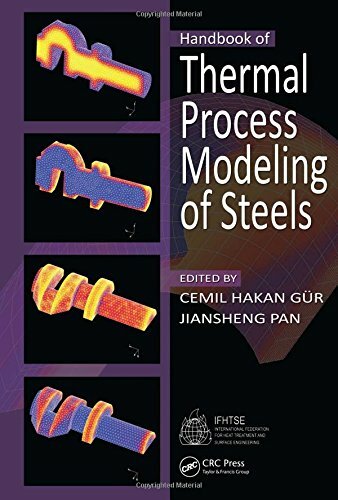 Enhances the quest for process optimization Comprehensive and authoritative, the Handbook of Thermal Process Modeling of Steels provides practicing engineers with the first complete resource that meets the needs of both those new to modeling and those hoping to profit from advances in the field. Written by those with practical experience, it demonstrates what is involved in predicting material response under industrial rather than laboratory conditions, and consequently, gives heightened insight into the physical origins of various aspects of materials behavior. Encourages both the understanding and the use of real time process control Before the advent of sophisticated computers, the errors inherent in computational predictions made modeling an ineffective gamble rather than a cost saving tool. Today, modeling shows great promise in both materials performance improvements and process cost reduction. The basic mathematical models for thermal processing simulation gradually introduced to date have yielded enormous advantages for some engineering applications however, much research needs to e accomplished as existing models remain highly simplified by comparison with real commercial thermal processes. Yet, this is quickly changing. Ultimately, those engineers who can move this tool of improvement out of the lab and onto the factory floor will discover vast opportunities to gain a competitive edge. No comments for "[PDF] Handbook of Thermal Process Modeling Steels".